Anyone else been impressed by those "BuzzFeed Tasty" videos going around on social media lately? Well, I have! Except not always impressed with the ingredients. 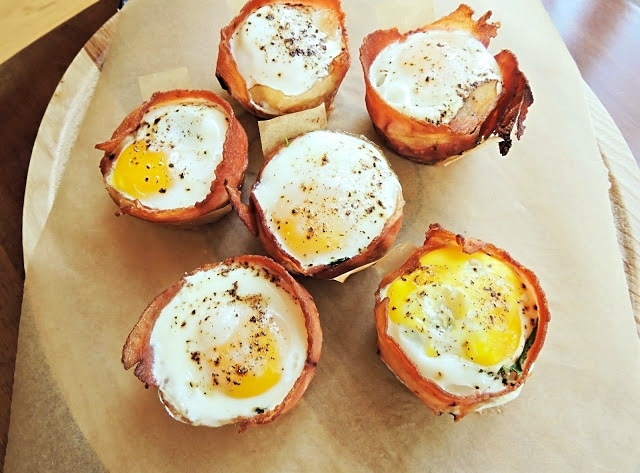 So, I decided to take a very tasty looking breakfast idea, and Paleo-fy it! It worked out perfectly, and we will be making these little guys again & again! 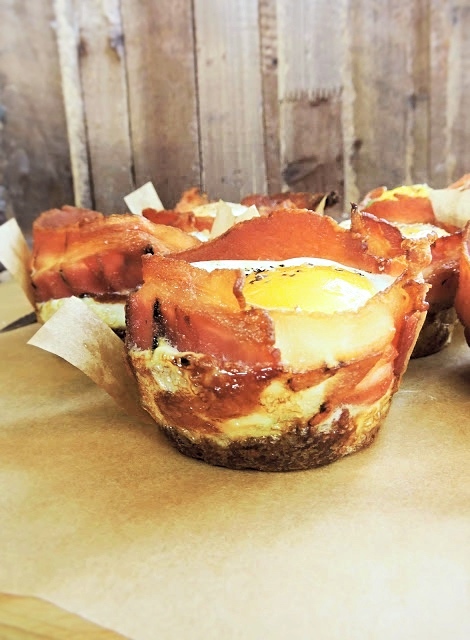 These breakfast cups would be great for entertaining, but were also a perfect on-the-go breakfast for work mornings this week! We made a batch to enjoy for our Sunday brunch, then ate them leftover the next couple of days~ & they reheated perfectly! Let me know if you give these a try, and if you have any other recipes I should Paleo-fy! Enjoy! Preheat the oven to 350ºF & get out a 12-cup muffin pan. Prepare your biscuit dough by mixing wet ingredients and dry ingredients in separate bowls, then combining them. 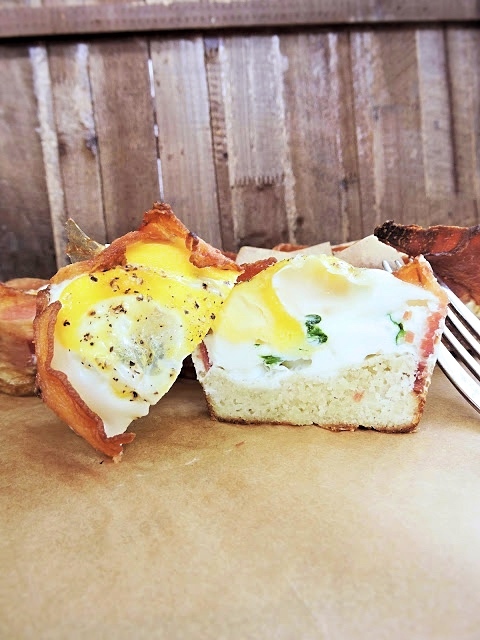 Evenly distribute the biscuit dough into the muffin cups, with parchment paper strips beneath. I used roughly 1 Tbsp of dough per cup. Transfer the pan to the oven, and bake for 8 minutes. Remove the pan from the oven, and increase the oven temperature to 400ºF. 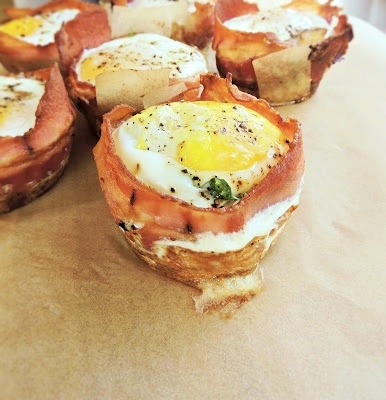 In each cup, wrap a slice of bacon around the edge**. Sprinkle the centers of each cup with torn spinach leaves or fresh herbs. Crack an egg into each cup, and top with salt & pepper. Return to the oven, and bake at 400ºF for 13-16 minutes. Mine were cooked for 15 minutes, and they had a slightly runny yolk. Stay closer to 13 minutes for a runny yolk, and increase to 16 minutes for a solid yolk. **Bacon Tip: Make sure your bacon is slightly warm so it won't crumble. I warmed mine in the microwave for about 10 seconds to soften it up before wrapping around each cup. Also, if your bacon strips aren't long enough to go around the whole cup-- you can tear up a slice of bacon to "patch up" each cup. Once the egg bakes it will set everything in place! Are the biscuit bottoms low carb?